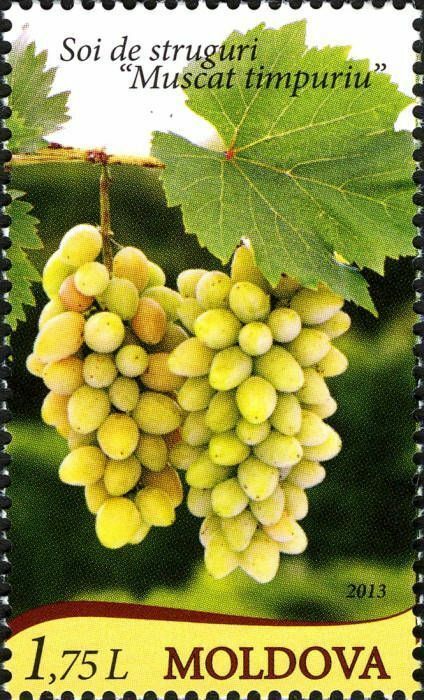 On 13 September 2013, the Post Office of Moldova (Poșta Moldovei) issued a postage stamp with the title Grapes of Moldova: «Muscat Timpuriu» (Early Muscat). The issue comprises one stamp, with an associated cancellation (postmark) and first day cover (FDC). The designer was Fiodor Cazac. The printing was performed by Nova Imprim, Chişinău. The Muscat variety of grapes of the species Vitis vinifera is widely grown for wine, raisins and table grapes. Their color ranges from white to near black. Muscat almost always has a pronounced sweet floral aroma. Muscat grapes are grown around the world. The breadth and number of varieties of Muscat suggest that it is perhaps the oldest domesticated grape variety, and there are theories that most families within the Vitis vinifera grape variety are descended from the Muscat variety. Read more.. This article uses material from the Wikipedia article 'Muscat_%28grape_and_wine%29', which is released under the Creative Commons Attribution-Share-Alike License 3.0.